What does it take to be a responsible parent. Not a whole lot but taking a 14 month and 5 year old child mountain climbing in the winter is probably not a wonderful experience for the children. Add to it that the family had to be rescued next to a 200 foot ravine after they got stuck in the dark makes matters worse. Rescuers were called out when David and Sally Naylor, who had decided to climb Scafell Pike in the Lake District with their baby son and his five-year-old brother, got into difficulty. They set out at noon on Monday, reaching the 3,210ft (978m) summit four hours later. During the descent the Naylors lost their way and, as darkness fell, they found themselves stranded in low cloud in an area close to a 200ft ravine. The alarm was raised at 7.30pm by a fellow climber who noticed that the family, from the village of Lynstone, near Bude, Cornwall, had failed to return to their car. A team of 42 mountain rescuers and two search dogs were immediately scrambled and the Naylors — cold and wet but uninjured — were located just before midnight near the treacherous Piers Gill path. The five-year-old boy was exhausted and had to be carried off the mountain on a stretcher. I like this quote by an experienced climber. Do you wonder if social services should look into this case? 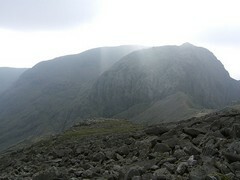 George Wilson, 58, said: “It’s insane to take small children up Scafell. It was incredibly irresponsible and put other people’s lives at risk. “Scafell is not to be taken lightly by anyone at this time of year, even the most experienced climber, but to take two little kids, including a baby, up there is sheer madness.” via TimesOnline . Let me guess, they couldn’t find a sitter! don’t they have bowling or mc donald’s around there? these people need to find an alternative method of family bonding.